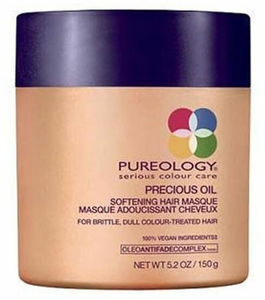 A deeply nourishing treament for brittle, dull hair, this Satin Soft Precious Oil Softening Masque from Pureology will give you silky soft, invigorated tresses that will have your friends envious. A weekly treatment, this masque works to fortify the hair cuticle to illuminate shine and deliver root to tip colour retention that lasts. Boasting a ZeroSulfate, ZeroSilicone concentrated-oil formula that leaves locks soft an gorgeous, you'll wonder how you ever coped without Pureology's Satin Soft Precious Oil Softening Masque.